Twenty years ago this month, seated in the White House’s Rose Garden and flanked by a bipartisan group of lawmakers, government administrators, and citizens, Bill Clinton signed the historic welfare reform bill. The legislation swept away the main cash assistance program for low-income families, Aid to Families with Dependent Children (AFDC), and replaced it with the more restrictive Temporary Assistance for Needy Families (TANF). With the stroke of a pen, Clinton ended the welfare entitlement, time-limited federal-funded cash assistance to five years over the course of one’s lifetime, instituted work requirements, converted the funding stream to a block grant (enabling each state to impose even greater restrictions), and, in what became the cardinal practice under the new more punitive welfare regime, set in motion sanction schedules across the states that penalized recipients for failing to comply with welfare-to-work rules. During his initial run for president, Clinton had promised to “end welfare as we know it.” And end it he did. But two decades later, despite supporters’ vows that welfare reform would “empower” the immiserated, the material standards of many poor Americans has only worsened. While welfare rolls have indeed shrunk, extreme poverty has only grown. AFDC originated as part of the Social Security Act of 1935. Though small, the program represented an improvement over the Mothers’ Pensions that states had initiated at the outset of the twentieth century. States that took the federal funding were now mandated to set up assistance programs for every county, standardize levels of assistance, and improve benefit levels (using money from the federal government). Still, the program had severe shortcomings. As with Mothers’ Pensions, people were generally discouraged from applying — especially non-whites. AFDC was also mostly limited to mothers with children: families with a male parent were often deemed undeserving of assistance on the grounds that the man should be providing for the family. To police such standards, AFDC workers would check in to make sure there wasn’t a male in the house and that the mother could provide a “suitable home.” Often this led to African-American mothers being judged unworthy of benefits (especially in the South). Significant change came in the 1960s as the Welfare Rights Movement gained steam and barriers to obtaining cash assistance fell. With recipients occupying welfare offices, court cases struck down discriminatory practices. More and more African Americans began receiving access to welfare. Richard Nixon and other political elites, seeking to stoke a white backlash, played up incipient perceptions of AFDC as a “black program” used by people hostile to white middle-class norms of work and family. Conservatives successfully introduced invasive restrictions — including requiring mothers to identify the father of their children and increasing unannounced inspections to enforce “man-in-the-house” rules — and froze benefit levels. If most eligible families were now receiving benefits, recipients confronted a welfare bureaucracy that dispensed increasingly meager assistance and often treated them poorly. By the mid-1970s, the economic crisis was squeezing government budgets (particularly in cities), adding pressure to slow the growth in welfare rolls. Restrictions on immigrants, especially undocumented immigrants, became common — led by states like California and New York, where migration from other states (and, to a lesser extent, abroad) stoked fears about people moving in just to get welfare benefits. In California, then-Governor Ronald Reagan popularized the term “welfare queen” to describe women with children who allegedly just wanted to live off state-funded subsidies. Reagan’s contribution to the anti-welfare cause was more discursive than substantive: as president, he secured more significant cuts to other social programs for the poor, particularly food stamps and housing assistance. Nonetheless, he had a keen interest in demonizing low-income families that relied on AFDC, and he signed legislation in 1981 that reduced beneficiaries’ ability to combine work and welfare. Still, those clamoring for a vastly reduced welfare program — or its complete abolition, as Charles Murray’s influential 1984 book Losing Ground proposed — were left disappointed. The Family Support Act of 1988 encouraged work and offered job training, but did not require it. In fact, the legislation led to increases in the number of welfare recipients (probably because many low-income parents desperately wanted help getting a decent-paying job). In the 1990s, the elite pressure to scrap welfare continued to mount, especially among Republicans. The 1994 Contract with America — the policy document of the so-called Gingrich Revolution — called for dismantling welfare and replacing it with a welfare-to-work program. For their part, Third Way “New Democrats” like Bill Clinton saw ending welfare as a way to establish their centrist bona fides and distance themselves from “tax-and-spend” liberalism. In August 1996, after vetoing two particularly draconian GOP versions, Clinton signed the Personal Responsibility and Work Opportunity Reconciliation Act. Within just a few years, political elites and their allies in the press had heralded welfare reform a success. Proponents did have some evidence on their side in the early years. The welfare rolls dropped precipitously, and the economy — powered by the dot-com bubble and low interest rates — was strong enough to absorb many former AFDC beneficiaries into the labor market (albeit with low-wage jobs). But this was short-lived. As the economy slowed at the start of the new century, welfare reform’s strictures proved inflexible, and many poor families that needed and qualified for assistance could not get it. Others simply chose to forgo TANF assistance because the associated stigmas and barriers were too great. 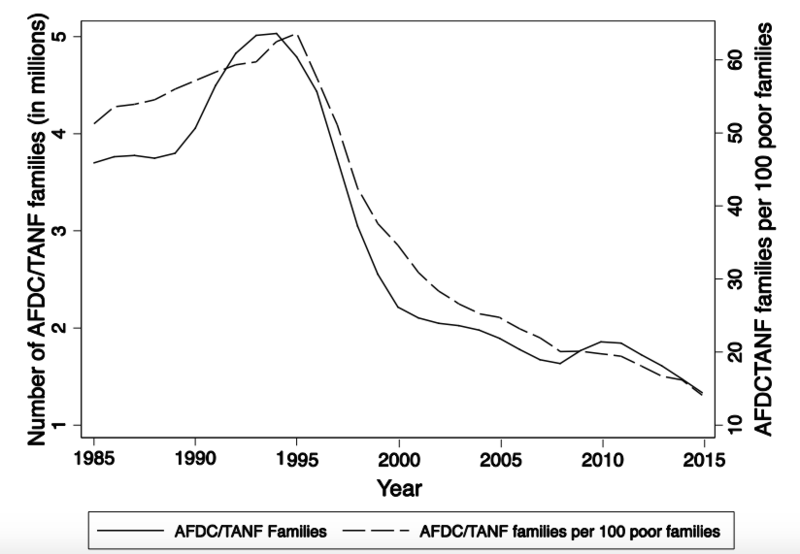 At its peak in the mid-1990s, AFDC provided benefits to approximately five million families — over 60 percent of all poor families in the country. As of 2015, TANF dispensed benefits to just 1.3 million families — roughly 15 percent of poor families (see Figure 1). In addition, despite the persistence of stereotypes about lazy welfare queens living extravagant lifestyles on the dole, welfare payments became even more meager. In 2013, they reached an all-time low: $438 per month on average across the states. The picture isn’t much better even after factoring in SNAP benefits. During the Great Recession, there was a significant uptick in the combined TANF-SNAP benefit level due to the stimulus bill’s temporary increase in SNAP payments. However, as soon as the assistance boost expired, the combined allotment resumed its downward trend, reaching the pre-stimulus level of $948 in 2013. This amounts to just two-thirds of the federal poverty threshold. And, of course, beneficiaries are prohibited from using food stamps for rent or utility bills. Scholars have had to reach for new terms to describe welfare reform’s malignant effects. Social scientists now speak of “disconnected mothers” — individuals who receive neither wages (because they cannot find work) nor welfare (because they can’t or choose not to endure the onerous regulations and stigmatization) and are forced to invent other ways of surviving. The best estimates suggest that the number of disconnected families now exceeds one-fifth of all poor families headed by a mother. In addition, according to Rebecca Blank and Brian Kovak, the number of disconnected mothers living alone has been growing, fully doubling between 1990 and 2005. Mothers may find themselves “disconnected” due to the loss of a job or welfare, the breakup of a marriage, the birth of a child, or because of some other reality of life on the bottom of the socioeconomic order. They depend on charity, family, friends, and the informal economy. They sell their food stamps to pay the rent. They increasingly sink into deep poverty (below 50 percent of the poverty line), or even into extreme poverty (less than two dollars a day per person — the lowest international standard). In short, Bill Clinton’s bill has proven quite good at booting people off welfare and exceptionally bad at allowing people who need it to get on it. Welfare is no longer an entitlement — states are not obligated to give families cash assistance; work requirements can be overly burdensome even before people receive any money; sanctions in the form of benefit reductions are frequently applied, such that families stop trying to receive assistance; and time limits force other families off. Even for those who manage to clear the requisite hurdles, TANF hardly delivers relief from the depredations of poverty. 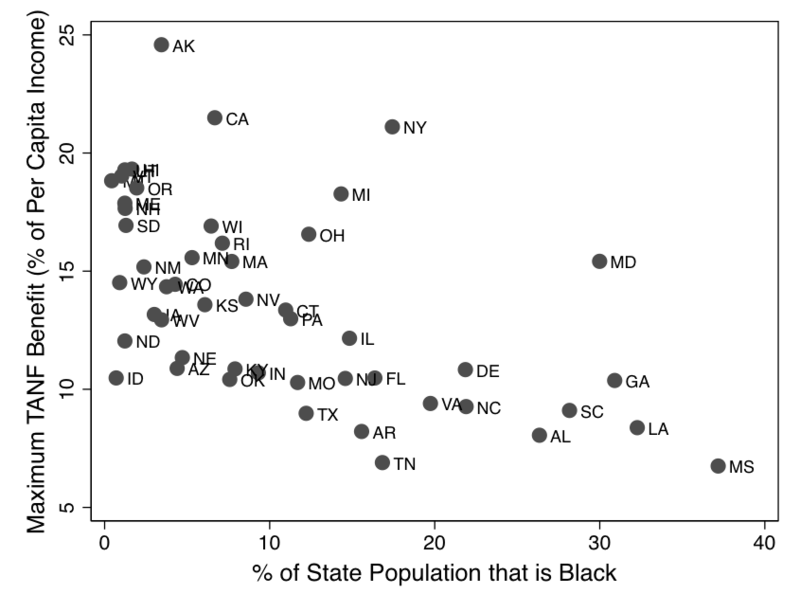 And that immiseration tends to be racialized: as the Figure 3 indicates, states with proportionally larger black populations tend to have stingier benefits, and black recipients are more likely to live in states where benefits are depressed well below the already-low national average. The same pattern holds for TANF’s eligibility requirements. States with the largest shares of non-white poor people have erected the highest barriers to qualify and remain eligible for TANF. The cheers have largely subsided in the years since. But they’ve been replaced by a deafening silence among policymakers. Low-income advocacy groups have been beating the drum, calling for anti-poverty action. And after years of offering largely positive assessments of welfare reform, academia has recently grown more critical. Yet Washington remains paralyzed by apathy. Earlier this summer, Paul Ryan and his fellow Republicans unveiled their anti-poverty proposal — a thirty-five-page document titled “A Better Way: Our Vision for a Confident America.” The plan reads as if it were written in 1995: the main recommendation for improving TANF is making more of the dwindling number of remaining recipients work (with no help for those cut off but still denied decent-paying jobs). Ryan and his colleagues are apparently unaware that, twenty years after welfare reform, the only people who stay on TANF for more than a month or two are those unable to work, often because of a physical or mental health problem that is debilitating, but not severe enough to qualify them for disability benefits. In addition, there are so few people enrolled in TANF (and the minimum wage has been stagnant for so long) that even if all recipients were forced to work, the poverty rate would barely budge. Most Democrats haven’t shown strong leadership on poverty either, largely because of residual fears about being pegged as tax and spenders on behalf of the poor. In the 1990s, New Democrats like Clinton used that anxiety to push for welfare reform. Now, even in the face of extreme hardship, most Democratic lawmakers are hesitant to speak out about, much less fix, the gaping holes in the welfare state. At the state level, GOP-dominated governments seem to be in a competition to see who can impose the harshest benefit reductions and most outrageous program restrictions. In recent years, states have instituted drug testing for welfare recipients and barred beneficiaries from using EBT cards at strip clubs and liquor stores — policies designed more to demonize the poor than to attack the imagined problems they purport to address. Twenty years after Bill Clinton signed the Personal Responsibility and Work Opportunity Reconciliation Act, it is clear we need to drastically revise the premature judgment that pronounced welfare reform a resounding success. There are far too many disconnected mothers falling into extreme poverty — and far too big of an expansion in the ranks of the poorest of the poor — for that claim to withstand even cursory examination. Ending welfare has proven to be a disaster for the destitute. We need a new war on poverty. Richard Fording is professor of political science at the University of Alabama. He is a coauthor, with Joe Soss and Sanford Schram, of Disciplining the Poor . Sanford Schram is professor of political science at Hunter College, CUNY. He is a coauthor, with Joe Soss and Richard Fording, of Disciplining the Poor . 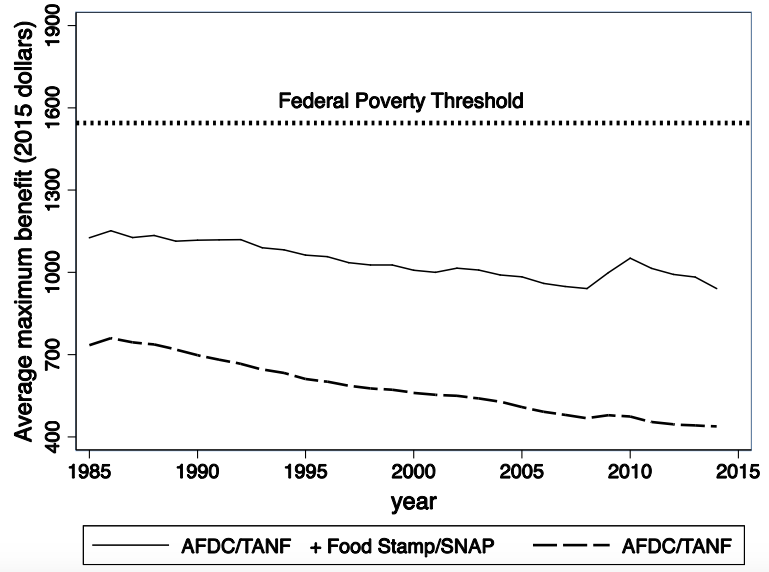 Two decades after its enactment, welfare reform has proven more effective at deepening poverty than ending it.